What do courthouses, cemeteries, churches, and libraries have in common? 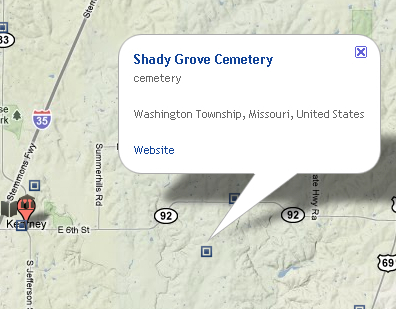 I've thought about having the cemetery info windows display links directly to that cemetery's findagrave listing (or a similar site). Let me know in comments your ideas on what site(s) I should have the places link to. By the way, when you choose "courthouses", you'll also see city halls; when you choose "churches", you'll also see synagogues, mosques, hindu temples, and other places of worship. TIP: The closer you zoom in, the more places you'll see. This is because the map limits the number of places displayed to 20 to help cut down on clutter. So when you're zoomed out too far only 20 places will appear, and many places will simply not appear until you zoom in closer to the area you want to explore. 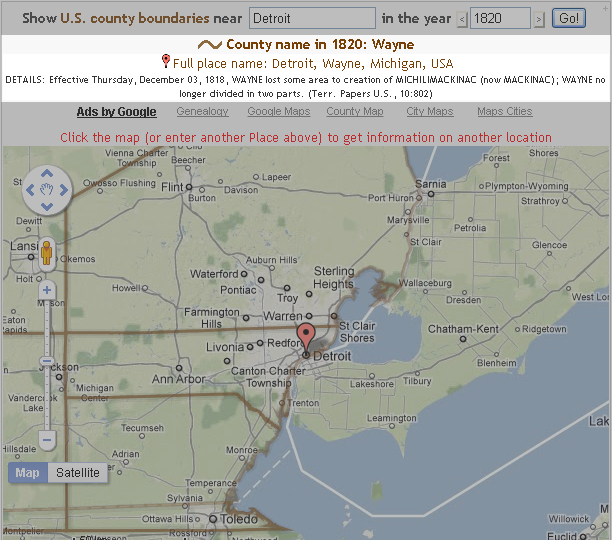 Check out the Historical U.S. County Boundary Maps tool here. UPDATE: Ancestry.com's App version 3.0.1 released 20 Nov 2011 has fixed the problem reported here. After having some problems with Ancestry.com's App on my iPad 2 a few days ago, I called their support. After their support representative talked to the App developers, she got back to me later that day that she was informed that the App "broke" under Apple's new iOS 5. She said that "the programmers upstairs are working on it and you should be getting an update right on your phone" or iPad. No ETA given. Quick background: I recently started using Family Tree Maker 2012 with it's new TreeSync that synchronizes FTM2012 with Ancestry Member Trees online, and supposedly works with the App too. The FTM to AMT sync functionality was working fine, so I went on to check out how it would work with the iPad App on my iPad 2, which I had recently upgraded to Apple's iOS 5. It didn't work. The symptoms were that the App said it was downloading 8651 people (the correct count), then it said "Processing 8671" (note the incorrect count). Then, when the tree appeared, only around 300 truly random people appeared in the entire tree and index, not even including myself. I exited, deleted the App, rebooted, reinstalled the App, and tried again. Same exact symptoms and results. That's when I called Ancestry and later that day found out the App broke under iOS 5. So, if you use Ancestry's App, you may want to hold off upgrading your iPhone or iPad to iOS 5. Or be aware that you may not be able to use the App until Ancestry pushes an update to your iPhone or iPad. Based on some discussions on Google+, this issue may not be happening to everyone using iOS 5. Has anybody else ran into this issue with the App? My website has experienced domain drama the last day or two. Basically, some people couldn't reach the site unless they used the www prefix (such as http://www.randymajors.com/p/maps.html), which was problematic, as most sites and searches referred to the site without the www prefix. 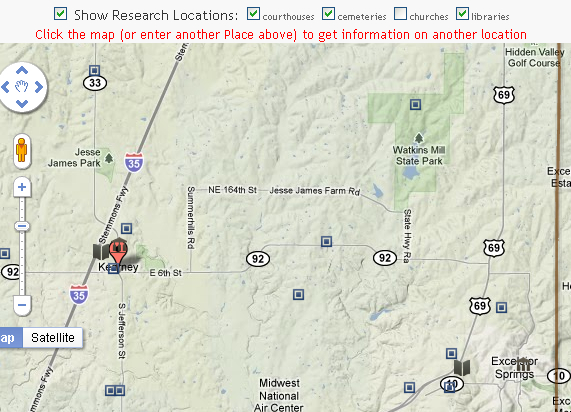 The site should behave such that it doesn't matter if you use the www or not (as in http://randymajors.com/p/maps.html). Long story short, the domain host settings appear to be reverted back to the correct settings now, but please leave a comment to this post if you're still experiencing trouble reaching the site. If you're experiencing issues, let me know if the issue was with or without the www prefix. 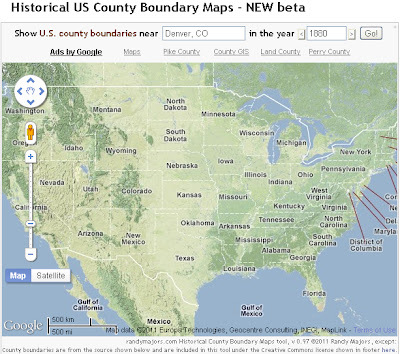 New and more interactive version of the Historical U.S. County Boundary Maps tool released! Check out the new and more interactive version of the Historical US County Boundary Maps tool! I want the details. The information panel above the map shows the year, county name, full place name, and details about the latest evolution of your county of interest's boundaries as of the year you chose. Source information about the boundary change is also shown in parenthesis at the end of the Details. QUICK TIP FOR GENEALOGISTS: Most people say that a best practice for recording locations in your family tree is to record the place name as it was at the time of a Fact or Event associated with your ancestor. As a shortcut to typing, you can select the "Full place name" text with your mouse as shown below, and then Copy (Ctrl+C) and Paste (Ctrl+V) it into a Fact or Event's location field in your favorite genealogy program or website. Today, Cortez, Colorado is located in Montezuma County. But in 1880 it was part of La Plata County. OK, I want to see more. Literally. Want a bigger map window to work with? Just click the little + sign in the upper right corner of the map pane. Now I'd like to time-travel. Click the arrow button on the right side of the Year box to scroll forward a decade at a time and see the county boundaries change before your eyes. Alas, you can also click the arrow button on the left side of the Year box to...you get the idea. *But I know the exact date I want. Based on feedback from Tami Glatz, you can now enter an exact date to see county boundaries in effect as of that date! Dates must be entered in the format M/D/YYYY, or you can still just enter a 4-digit year if you want. But what about the rest of the world? Sorry, the Historical US County Boundary Maps tool is only available for the United States. However, you can view rough historical country (with an "r") boundaries with the Historical World Boundary Maps tool. Find the new version of the Historical US County Boundary Maps tool here. I look forward to your comments below on these enhancements! And don't forget to click the Like, Tweet, or +1 buttons on the left side of the map...they help spread the news about this map tool. Enjoy! OK, maybe you won't surface any actual ancestors with these tricks, but you very well may surface a number of buried web pages about them! By using these tricks, I've found many additional web pages that were buried deep in the far recesses of the internet that mentioned my ancestors. This particular search doesn't find anything across all of Google (see first image below). And if you were just typing these names into Google, you'd have to wade through about 17,100 search results to find that out. Fun. (see second image below). I know...you could type the following text into Google's search form including placing all the pipes (that's the "|" key) and quotes and spaces in the right places, typing both forward and reverse name order, etc., but isn't that a painful waste of time when it's something the AncestorSearch form does for you? "william majors"|"majors, william"|"william magers"|"magers, william" "samuel samples"|"samples, samuel"|"samuel sample"|"sample, samuel" "cowley"
Are you sure you're looking in the right county for those records? When doing genealogical or historical research, it's helpful (if not essential) to know what counties to search for the timeframe you're interested in. And as we all know, boundaries shift over time. So you may think you know what counties to search, but is there a chance you're missing something? Take a look at this example. Let's assume you're looking for records for your homesteading ancestors who settled in the region between Albuquerque, Los Alamos, and Santa Fe, New Mexico. This animation shows the boundaries by decade from 1850 to 1950. Those county boundaries were anything but stable. Take for example the community of Los Alamos; it was part of the following counties during that period: Santa Fe, Rio Arriba, Bernalillo, and Los Alamos. And this is not the exception, it's the rule. According to historical geography expert John H. Long, on average, a county's boundaries shifted 4.5 times during its existence. Especially during times of colonization and westward expansion, the boundaries on those frontier counties typically shifted much more than that, new counties were created, and old counties became defunct, and counties swapped parcels of land. The latest newsletter from UK webssite LostCousins.com contained the following story. It's such a great example of a success story using my AncestorSearch tool that I just have to share it. It's an important reminder that exactly how you format your Google search really does make a huge difference in the results you get; AncestorSearch helps format your Google search to achieve more focused and successful genealogical search results. See here and here for more background info, and give it a try -- even for those ancestors you've searched for hundreds of times before to no avail. My grandfather Ernest Edward Ruffell (1903-1949) came to Australia in 1924, after he had had a falling out with his father. Family legend says that his father paid for his ticket to Australia on the proviso that he never came home. Whatever the truth in this story, after my grandfather arrived he changed his surname, and went on to marry and have a family of his own. He sadly died young of tuberculosis. When the family in England tried to reconnect with him in the early 1950s they found it almost impossible, and by the time they had, he had already passed away. They were very briefly in contact with his children in Australia, then fell out of contact again. In one of your recent newsletters you recommended a genealogical search engine. 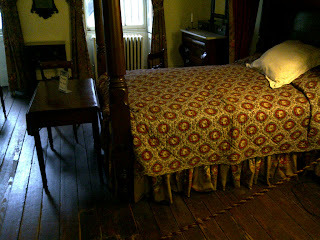 So I went to it and entered my great grandfather Charles Alfred's name, as I had a hundred times before in other places. I was amazed to find a reference to a newspaper request for info on Charles Alfred and his wife. It had an address and phone number. So I decided to ring the number, and was thrilled that the person who answered on the other end was my grandfather's niece (daughter of his sister). She was also thrilled and told me that the family back in England had been thinking about their Aussie relatives for years. Anyway this has led to a wonderful reconnection with the family, with lots of photos and stories (including two more of my grandfather... previously we only had one of him). I want to send you a heartfelt thanks for recommending the search engine, and hence for helping to reconnect a family that has been apart for over 80 years! Every day I receive emails from researchers who claim to have "tried everything" and "looked everywhere", but it's the ones like Edward who persevere (and keep an open mind about where the next clue will come from) who get the success they rightly deserve. The above story is from LostCousins.com founder Peter Calver's latest newsletter. Historical World Boundary Maps back to 2000 BC! This is an update to my original post here. The Historical World Boundary Maps tool has been updated to include boundaries from 2000 BC to 2008 AD. Just type in a PRESENT-day city and country, and a HISTORICAL year, and click Go! The boundaries will appear, and you can then click the map to see what the name of the country, empire, or kingdom was at that location for the year you typed. Note: The information for all years prior to 1946 includes very generalized boundaries, very rough timeframes for the boundaries, and includes some errors and omissions. As such, the information for that timeframe should be used as a very rough guide only. First U.S. Counties...now The World! Please see an update to this post here. UPDATE: The Historical World Boundary Maps tool has been updated to include boundaries from 2000 BC to 2008 AD. Google+ has really created quite a buzz! It's estimated to have over 10 million users already (see here), and readers of this blog will be interested to know that Google+ already has a large and active genealogy community. Try out GplusSearch and feel free to leave comments below. NEW AncestorSearch version 1.5: See Google Search results in real-time as you type! This article refers to the AncestorSearch using Google Custom Search found by clicking the link at the top-right of this blog. Before I get to the exciting enhancements to the tool, I first want to say thank you to all of the people who have been using it (over 18,000 hits in the last couple of months), and the many compliments and write-ups from people who have extended their family trees as a result of the tool. For example, Peter Calver, founder of LostCousins, stated in his 6 Jun 2011 newsletter "the first time I tried it, it led me to a new 'lost cousin'". As you type, you will now see a real-time Partial Preview of Google Search Results at the bottom of the form. Play around with this, as I think you'll find it very useful (I've already found a few new connections because of this feature). For example, you can quickly type different spellings of names and in real-time see what difference it may make in your search results -- without ever leaving the search page. Next, before clicking the Search button, you can edit the search string however you wish in the long box. For example, you may want to add an exclude term to the end of your search: if you're getting too many irrelevant search results that are coming from cnn.com, you could just add -cnn.com to the end of the search string (not to pick on cnn for any reason). Or, if your ancestor shared the same name as someone associated with George Washington, but you were getting overwhelmed with search results on George Washington's associate, you could add -"George Washington" to the end of the search string to exclude pages mentioning that founding father. Then, when you're ready to run your full Google search, just click the "Run Full Google Search" button. Your results will now appear in a new window (or new tab). This was an often-requested enhancement so that it was easier for people to go back and make changes to their search without having to type in all the search terms again. Give the tool a try and leave comments on if it helps you find more connections in your tree too! And as always, I welcome any suggestions for future enhancements. Also, check out the enhanced Historical County Boundary Maps tool on this website to put your search in the correct historical geographic context. It uses Google Maps to display US County Boundaries from ANY HISTORICAL YEAR. You can then click any county on the map to see info on the county in that year, and you can click the < and > buttons next to the year to go backward and forward a decade at a time to instantly see how the boundaries shifted around your ancestor. This is an update to my original post, "Does this Google Custom Search help find records about your ancestors? ", and the follow-up, "Updated: AncestorSearch using Google Custom Search, version 1.1". Thanks so much for all of the interest in this tool, and for your positive comments and constructive feedback! I've incorporated several enhancements into the current version. We all know the importance of county governments for maintaining various types of records that are useful for genealogical research. But how often have you tried searching for an ancestor's historical records for a given county, only to realize that you were searching in the right place but the wrong county? In fact, according to John H. Long, the director of the Atlas of Historical County Boundaries Project at the Newberry Library, "the average number of boundary changes per county in the U.S. is 4.5". This means that there's a very good chance that you are sometimes looking in the wrong county for some of your historical genealogical records. Most of us who have taken Family Tree DNA's Family Finder test or 23andMe's DNA Relatives test have lots of Matches to work with. Those Matches are typically lots of potential cousins that you may be able to connect with and share information in order to help each other both validate and expand your family trees. So what's the problem? Strangely, it's often that there are lots of Matches to work with. I've tested with both companies, and I have 302 Family Finder Matches and 1,021 DNA Relatives Matches! So, what's a decent strategy for narrowing this large number down to something more manageable? Or at least for prioritizing the list so as to not get buyer's remorse after lots of non-responses and even more unfound connections. And how can both company's test results be used together to find more Meaningful Matches? Full disclosure: I am the 6th great grandson of the North Carolina Abraham Enloe from the article. The Lincoln-Enloe tradition certainly has been passed down through my family line, and while intriguing and even somewhat compelling, I've never seen enough credible evidence to plant my flag in the Enloe camp. Its the best-preserved 19th-century house in Manhattan. They're also currently exhibiting Civil War wound photos from the Burns Collection (not quite as gruesome as it sounds, yet quite moving). I recommend the museum; Google the museum for more info. Does this Google Custom Search help find records about your ancestors? I hesitate posting this prematurely, but I welcome some initial feedback from the genealogy community on a search form that I've built. I've built an "AncestorSearch" Google Custom Search form on my blog that I've been using to find records on my own ancestors, and it's worked pretty well for me so far over the last several weeks. I'm choosing to share it now in case others find it useful as well. 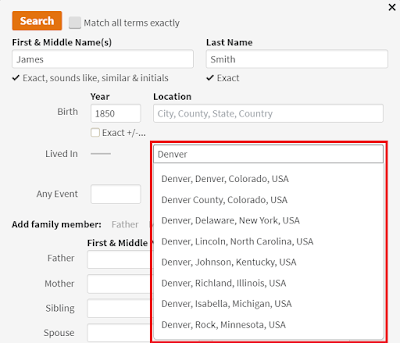 Basically, this AncestorSearch search form attempts to filter through much of the irrelevant noise on the web and return a much more focused set of results which are more likely to be about the ancestors you are looking for. The search returned 21,300 results, none of which were relevant to my ancestors in page after page of search results. First day of 23andMe test results, and already a breakthrough! I've been a FamilyTreeDNA customer for a couple of years, and I've had great success with using DNA testing combined with traditional genealogical research to break through one brick wall so far (see here http://randymajors.com/2010/12/man-who-wasnt-john-charles-brown.html). I recently became a 23andMe customer as well...their holiday special was just too good to pass up! Out of respect for her privacy, I'll not mention her name, but here's how the process has gone thus far. Again, this was all in just the first day after receiving my test results! Her profile mentioned a few names that I thought were worth exploring since they match names in my tree: Fuller, Pierce, Pugh, and Warren, and "possible names" (her words) Hart and Shofner. So I accepted her invitation to connect and asked her what else she could tell me about those particular family lines. "Henry Shofner 1755-1847 & Chloe Hart b.abt 1765 from Green CO KY may be my 4th gr-grandparents. My gr-gr-grandfather Wm. Pringle appears to be their daughter's child. Is this the same family as yours? [She then goes on to list details about the 5 other matching surnames] Anything ring a bell? Of course, I'm hoping that the Hart/Shofner does. That could answer one mystery in my tree." Well, we found a match in a speculative branch of her tree, since Henry Shofner and Chloe Hart are my 6th great grandparents! I've shared this information with her, and have offered to give her access to my private family tree on Ancestry.com so we can compare more details, confirm facts, share photos and more! All in all, a very productive first day of results on 23andMe! President Lincoln writes a letter of thanks for "a pair of socks so fine"
On 4 Dec 1861, President Abraham Lincoln wrote a letter to my 5th great grandmother, Susannah Crume Weathers, thanking her for a letter and gift she had recently sent him: "a pair of socks so fine". It seems quite funny and odd on the surface of it, and yet how quaint, charming, and even noble it is. The letter is inspirational to me, as it exemplifies President Lincoln's unpretentious and accessible character. Below is the letter as reproduced in The Collected Works of Abraham Lincoln, Volume 5 (Wildside Press, 2008). How I'd love to see the original letter Abraham Lincoln had received from Susannah on 26 Nov 1861, and to see this original handwritten letter from Abraham Lincoln back to her. It's even more astonishing that Abraham Lincoln wrote such a letter considering that this was in the middle of the Civil War, and knowing that he had untold pressing issues to attend to. According to The Collected Works of Abraham Lincoln, Volume 5, Abraham Lincoln wrote six other correspondences on the same day (4 Dec 1861): two to Simon Cameron, two to the House of Representatives, one to George B. McClellan, and one to William H. Seward. The issue is that the bottom of people's faces are cut off in the Pedigree view, as you can see in the screenshot below. Now, skeptics may opine that this must be a problem with my photos. Not so :) The bug appears to be unique to the Pedigree view: the pop-up that appears when you hover over a person in Pedigree view, as well as the Person Profile page -- which all use the same photo -- all display as they should as you can see in the screenshots below. "you’ll be happy to know that we’re in the process of fixing this. Look for the update in the next week or so." Yeah! Soon, we won't have our ancestors peering over the fence at us!